With a Bumblebee movie already on the way in 2018, it seems like it’d be only natural that an original graphic novel was also en route. That’s just what publisher IDW has on tap. The above line is synonymous with Transformer: The Movie. Yes, I understand that you might not immediately think of it when referencing the animated 80s classic, but it is. While “The Touch” is the easy favorite from the flick’s soundtrack, “Dare” (which features those lyrics) is right there with it. Why does any of this matter? 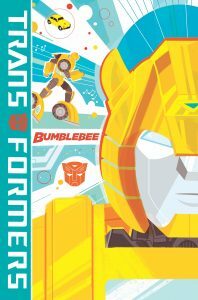 Because just like this year’s Bumblebee movie is set int eh 1980s, so’s this OGN from IDW. Of course, that’s where the similarities end. Presumably, this OGN will be in-continuity for IDW’s Transformers line of comics. Just how much the movie that the subtitle bowers from plays in is a mystery however. There might not be any link though, as this could be a simple tip of the hat to a fan-favorite. Watch for Bumblebee: Win if You Dare to hit stores this coming September the 11th. It’ll run you $9.99 USD.